I dread the end of summer. I miss the kids when they're at school, although I do manage to get more written without their company. I miss the amazing tomatoes from the garden, which are now shrimpled, brown, ungainly vines. I miss the incredible sweet corn from our local farmer. And I'm holding a little grudge, too, because he assured me there would be corn until the end of August. Excuse me? It's only August 22. Give me my corn! I know that soon—too soon—I'll be missing those drippy, hurt-your-teeth-with-sweetness South Carolina peaches. I'm currently eating my weight in peaches daily. Speaking of weight...guess who lost 25 lbs? Still, there's more to go, but for now I'm celebrating. And you know how I did it? By eating the most delicious, fresh, amazing local fruits and veggies instead of junk. And eating less. Still, this isn't about diets and weight loss or the fact that I did just eat a handful of Lucky Charms. This is about celebrating summer and gorging on delicacies that we'll miss when it's cold, gray, and nasty. I've never been a cobbler girl. My dad used to make cobbler, using the doughy Bisquick mixture as the topping. I would scrape off the mushy biscuit wannabes to get to the good stuff underneath, still wishing for a bit of sweet, crispy topping. When faced with an enormous load of peaches I bought for my lunches, I realized we would soon host a fruit fly fest in our kitchen if I didn't use them quickly. It was time for a crisp. Naturally, I turned to my good friend, Alice Waters. , but she holds my hand when I have an overabundance of zucchini or spinach and no creative culinary thoughts in my brain. Alice doesn't bully or tease about my domestic shortcomings—but she insists on the real deal. She makes cooking—and eating—a pleasure. I'm not quite sure what she was thinking. After all, in college we lived on Raman noodles and Avanti's pizza bread. Cooking didn't coincide with my lifestyle. But they can't have my copy. I still look up the recipe every time I make peach crisp. Last night, I opened Alice's book and tackled the pile of peaches while Peter and Mikey went to soccer practice. By the time they came home, the house smelled amazing. Of course, peach crisp alone is delicious. Peach crisp with homemade whipped cream, however, is divine. So, to help you celebrate the dwindling summer days, I'm sharing with you Alice's recipe for Peach Crisp, and my own recipe for homemade whipped cream. You may need to travel to SC for the peaches, because you know we grow the best peaches in the country, right? 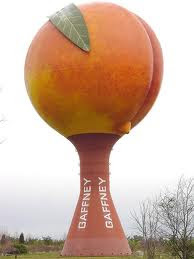 We even have the giant peach to prove it. Add the sugar and flour to the peaches and mix well. Place the fruit in a 2-quart baking dish to await the topping. 1-1/4 cup flour6 tablespoons brown sugar1-1/2 tablespoons granulated sugar¼ teaspoon salt (leave out if using salted butter)¼ teaspoon ground cinnamon (I used a little more—we like lots of cinnamon. )12 tablespoons butter, cut into small pieces. First, thoroughly mix all of the ingredients except the butter. Add butter a bit at a time, mixing into the flour mixture with your fingers, a pastry blender, or stand mixer using the paddle attachment. (Because I'm a lazy cook, I use the mixer.) Work until the mixture comes together and has a crumbly texture. Spoon crisp topping evenly over the top of the fruit mixture. Place in 375-degree oven and bake for 40-45 minutes. Add all ingredients into bowl of stand mixer. Mix on high for 2-3 minutes or until correct whipped cream consistency. (Check mixture frequently after two minutes to ensure that you're not making butter!) Can store in the refrigerator for several days. Serve with peach crisp. Or eat by the spoonfuls without any adornment, as Kiki is known to do. Happy end of summer fruit binging!